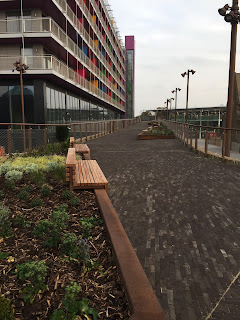 The public realm on the old carriage ramp in front of the Deptford Project was finally unveiled last week - give or take a bit of snagging - and I was keen to explore and see what I thought about it. 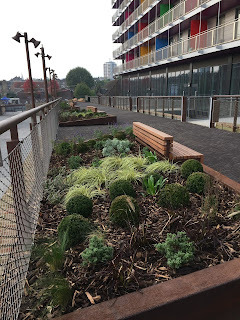 We've had a preview of what to expect ever since the area outside the station entrance was open to the public, with bins added after a fair bit of moaning about litter levels by the new businesses and yours truly. It seems the litter problem is still not fully resolved - all three of the bins at ground level were full to overflowing on the first Saturday morning with presumably no prospect of them being emptied ahead of the busiest day for local businesses. 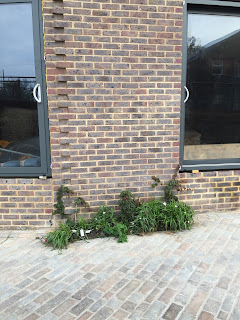 Added to that when I did my rounds it seemed some of the new occupants were not fully buying-in to the clean and tidy theme of the forecourt. 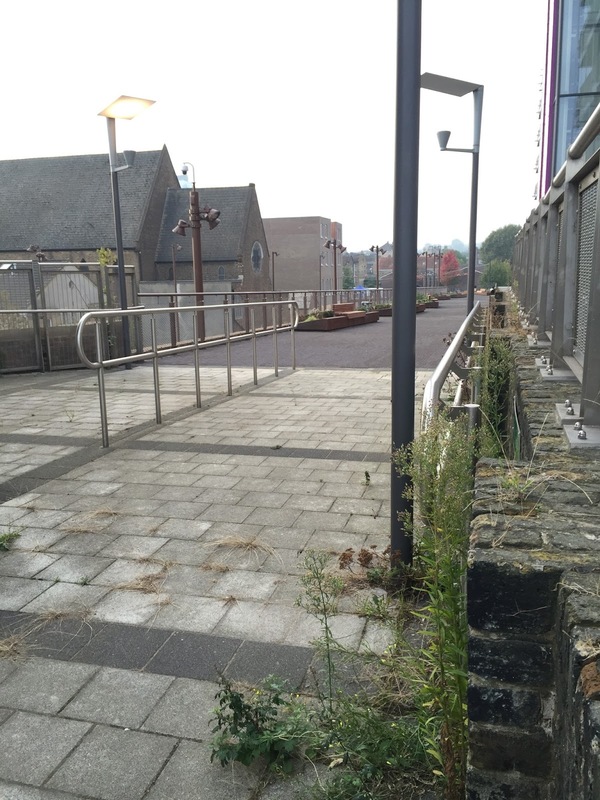 Other than the three bins already mentioned - two on the approach to the station and one around the back of the new route, halfway along the carriage-ramp units - bins are notably absent from the whole of the remaining public realm. Either that's going to have to be resolved promptly, or it's going to need daily sweeping. 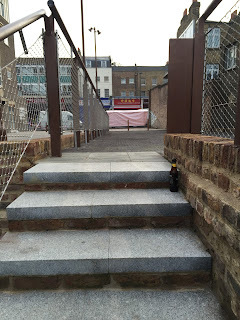 Currently the route through to the market is blocked off - no obvious reason why as the anti-cycling barriers are already in place and it all looks like it should be finished. 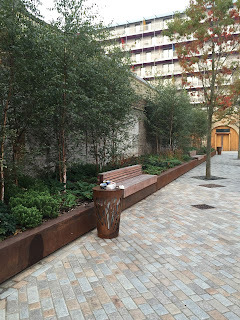 There's not much greenery at the lower level aside from the planting right outside the station, and this pocket-handkerchief-sized bed seems a little out of place tucked alongside the extension to the back of St Paul's House. 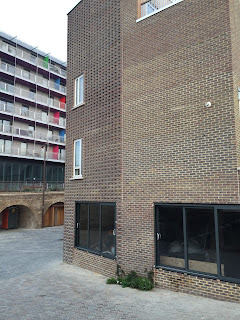 The two smallest arches of the ramp are open to provide access through to Octavius Street, although one of them is currently occupied by a plastic portaloo, presumably because the facilities that were promised for tenants of the units are yet to be finished. Approaching from the high street along the ramp you get a good view across Douglas Square which has the potential to be a great people-watching spot when the market is on - and perhaps for observing the street drinker shenanigans and kids on bikes when it's not. Further up the ramp there's quite a few seats for those wanting somewhere to eat their lunch or drink a can of pop or something stronger. Sadly none of them are located in the best place for views. There's two seats at the lower end that face out across the new public realm towards the extension on the back of St Paul's House, but the remainder all face away from the action, pointing directly at the new block itself. I'm somewhat puzzled as to the reason for this, perhaps it's more about 'managing' the use of this space rather than giving visitors a good view. Planters are made with weathering steel which means that they match nicely with the wooden benches. A couple of them have these huge hydrants sticking out of them which look totally out of place and rather ruin any effort to have everything matching and harmonious. 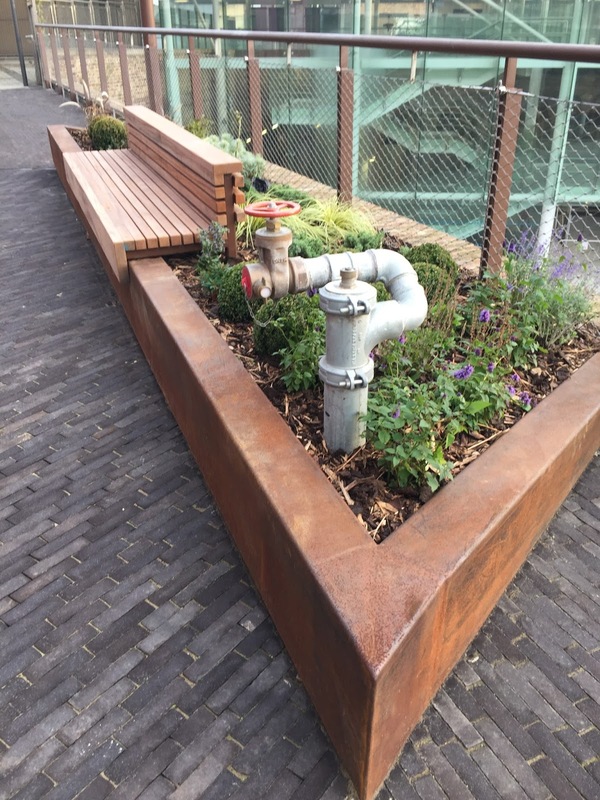 I guess the landscape architects didn't have any say on this one, they just had to incorporate whatever the safety engineers specified. 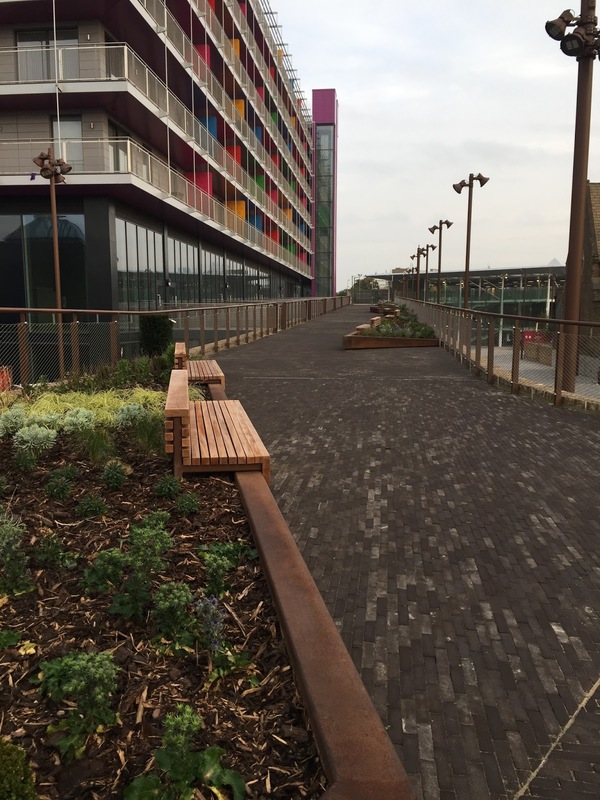 The paving of the public realm is generally pretty good quality and the materials chosen look good. I'm hoping this will last beyond the first year or so before developing sunken potholes from bad construction or getting stained beyond recognition as a result of poor maintenance, like the stuff on the high street. However it's unlikely to suffer wear and tear any time soon as there's currently little purpose for anyone to use the ramp. None of the commercial units at the upper ramp level is open yet - and with only one future tenant officially announced so far it seems like it could be a while before this changes. You can't even use the ramp for its original purpose - to get to the station platform - because the ugly gates are firmly locked and there's been no attempt to maintain the top of the ramp in any case. 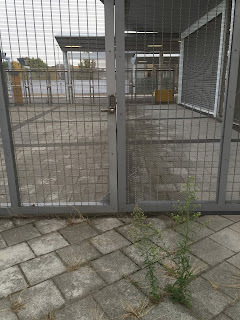 I seem to recall that the gates won't be open for public use until someone (presumably the developer) coughs up to have Oyster card readers installed. A ticket machine at the upper platform level would also be sensible, given that there's only one, alongside a ticket office with some of the shortest opening hours in the London area; apparently Southeastern is rolling out a whole load of new ticket machines but as yet there's no word whether that includes a second machine for Deptford. 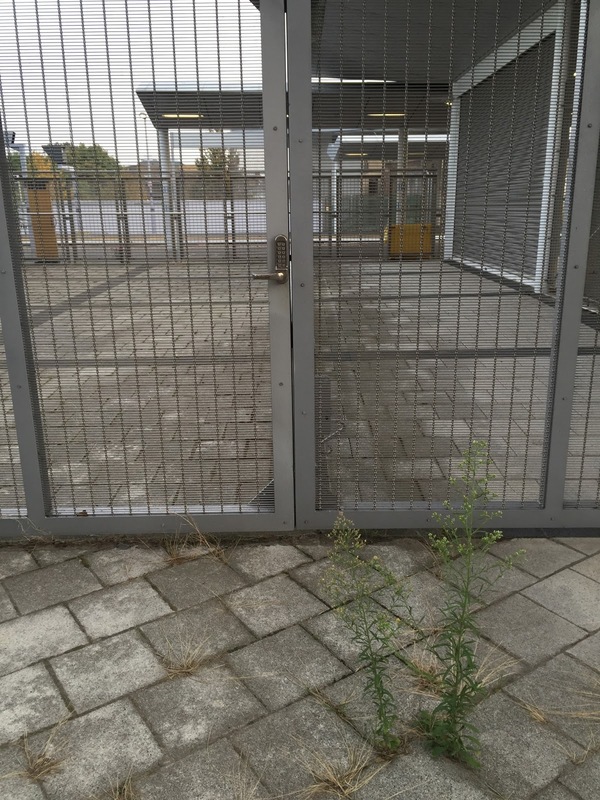 Perhaps if tenants are found for the commercial units they'll be able to do some agitating as regards the access arrangements; until then, the ramp will remain something of a white elephant. My only major bugbear about the quality of the final result is the disappointingly poor job that's been done on St Paul's House. The cheap replacement windows don't suit the rest of the building at all, and stick out like a sore thumb alongside the elegant stone details of the lintels and door frames. 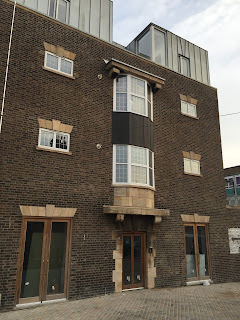 It's difficult to appreciate the finer qualities of what could have been a simple and aesthetically-pleasing building when your eye is constantly distracted by these squat, ugly white frames. 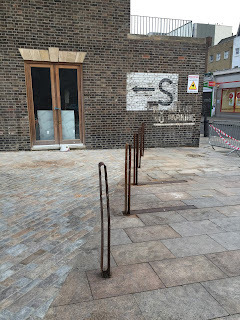 When so much care has obviously gone into detailing the public realm and the shop units in the carriage ramp, including designing bespoke street furniture to suit, it's sad that this level of quality does not extend to the buildings themselves. There's still some snagging to be done, however, and I hope it is not going to be forgotten about. 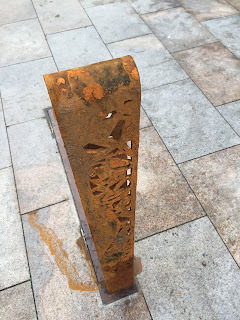 For example, the weathering steel of the bollards at the south entrance are looking a little, er, weathered, not to mention giving the impression of having fallen foul of the Deptford High Street Sunday Driving Fuckwittery. It would not surprise me - they do look a little insubstantial in this picture, and I'm sure it won't be long before at least one takes a bow courtesy of poor manoeuvres by UPS/Yodel/Iceland etc. The driving fuckwittery. Lets all not be shy here. It's mainly the result of Sunday shopping and Sunday worship, they seem to think that God and Mammon allows them to park on the square in front of the library and on both sides of the high street opposite St Pauls. Crazy. 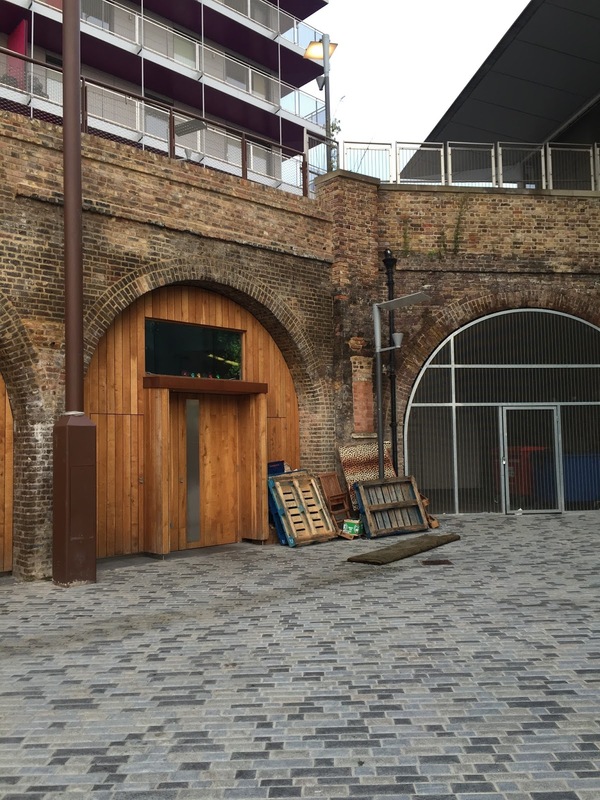 chase insurance claims will be setting up a permanent shop in one of the arches. Perhaps they thought a flat surface would only encourage skateboarders? But then surely not as the ramp itself presents an almost perfect opportunity for prime slalom action. Those that were formally rolling their boards over the seating in front of Tidemill schooll must be dribbling and drooling with anticipation. And what, in Gods name is that stench? The one that drifts over from the units on Ffinch St, it's like old fish and new sick. Just what are they doing there? Killing beasts? Making pukka puke pasties? How that coffee shop and Nan's put up with it I don't know. New ticket machines? By the company whose franchise is expiring in around 18 months? When TfL has submitted a claim to take over the metro services as part of London Overground? I'd be surprised. So I am not the only one to have noticed the putrid fishy stench from the far side of deptford station? Has anyone any idea what it may be or who I can report it to for investigation? 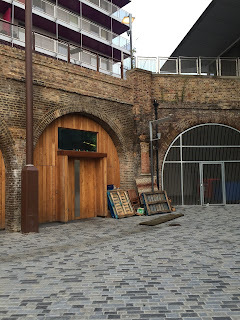 Quiet how the newly planned restaurants opening in the arches will Attract any trade while the area smells like a septic tank I do not know. you are so lucky to have this high quality public realm going into your neighbourhood - i feel like upping sticks and hoiking over to join you. Tired of whingeing about the 'gentrification' of east London - whats wrong with having a decent modern and aesthetically modern public realm accessible to the whole community ? 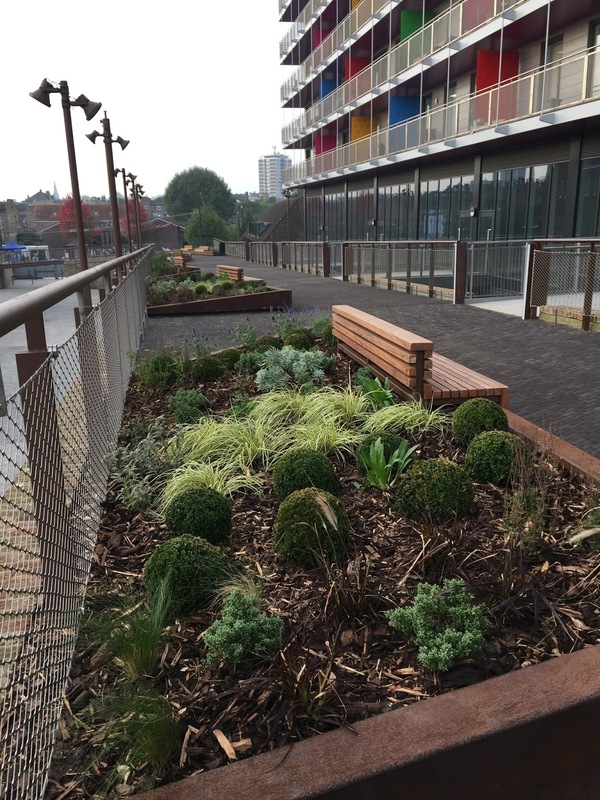 Well done Lewisham! The square looks pretty great. Those plastic windows though... that's vandalism. They look absurd. They are there! It is open!